Moapa, Metro Rail News: California is all set to sharply scale back its plans for a high-speed rail artery meant to transform travel up and down the state. But in the desert outside Las Vegas, the transportation ambitions still seem limitless. Here, engineers working for Virgin Hyperloop One are testing a radically different type of mass transit: one that aims to move people and cargo in small wheel-less pods in a vacuum tube at speeds that could exceed 600 mph. Today’s swiftest rail travel, at top speeds less than half as fast, would become a quaint anachronism. 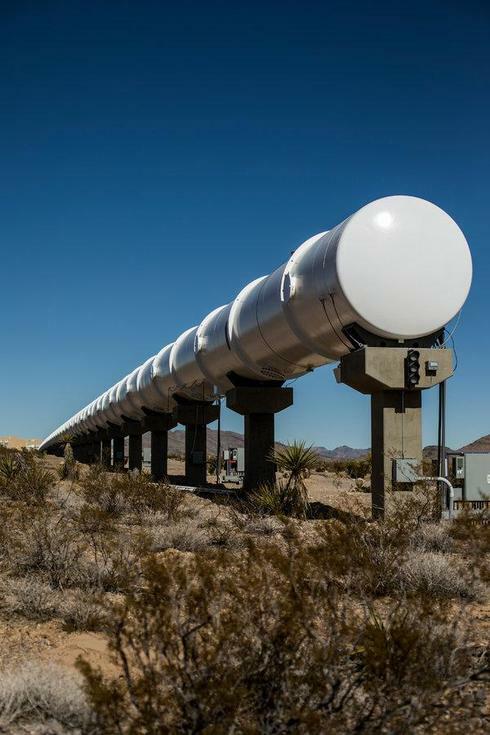 The company, which counts Richard Branson’s Virgin Group as a minority investor, is one of several in the United States, Canada and other countries developing hyperloop technology. The concept was promoted by Elon Musk, of electric-car and private-rocket renown, and then offered by one of his companies as open-source technology available to all. It works by propelling pods using magnetic levitation through a low-pressure, nearvacuum tube. The low pressure minimizes friction and air resistance, greatly reducing the power needed. And because the pods travel in a tube, they’re not subject to shutdowns because of harsh weather like snow and polar vortexes. In the desert 35 miles north of the Las Vegas Strip, Virgin’s 1,640-foot-long, 11-foot-high tube has been used for hundreds of runs, with an empty pod that in one test accelerated to 240 mph. Plans call for the commercialized system to reach a continuous 510 mph, with 670 mph possible. To avoid making anyone sick, the system would take three minutes to accelerate to that speed, and the train would need to travel 6 miles to turn 90 degrees, said Ismaeel Babur, one of the company’s senior civil engineers. Each of the three companies has raised tens to hundreds of millions of dollars and developed its own patented approach to long-distance mass transit. TransPod, with $52 million in capital, has preliminary agreements to build a 6-mile test track for a route that would eventually span the 180 miles between Calgary and Edmonton in Alberta, as well as a shorter track near Limoges, France, for one of several French routes under consideration. Hyperloop Transportation Technologies, which has raised $42 million, is in the design phase for a 1,100-yard test track in Abu Dhabi, United Arab Emirates, and is preparing to build a 350-yard test track in Toulouse, France. Virgin, which has raised $295 million, is in the developmental stage with projects in India and Ohio. Last month, the Indian state of Maharashtra declared the company’s proposed hyperloop system between Pune and Mumbai as an official infrastructure project. Construction on a 7-mile test track could start this year, said Jay Walder, the company’s chief executive. Another difference from other transit systems will be the passenger experience. To keep the structural integrity of the near-vacuum tube, there will be no windows. “People would get sick looking at trees passing by at 600 mph,” said Sébastien Gendron, TransPod’s chief executive. Instead, developers are looking at various exterior simulations that could be projected on large screens throughout the pod. “We could create a depth effect through video projection,” Gendron said. Even movies could be shown. Ahlborn believes that showing advertisements and providing other services to travelers could provide additional income that would hold down fares. “The worst thing that would happen to us is if Virgin Hyperloop One is not successful,” Ahlborn said. Whether any company can garner the necessary finance is still an open question, leading Ahlborn to wonder if anyone can ultimately go it alone. “Maybe there could be consolidation between our companies,” he said. Rick Geddes, professor in the department of policy analysis and management at Cornell University, sees a different challenge. “The biggest problems for hyperloop will be securing rights of way and permitting,” he said. Still, Geddes believes that hyperloop systems will become a reality, as the time is ripe.